Some say "ignorance is bliss", others say "knowledge is power". In truth no state of blissful unawareness can contend with the satisfaction that comes from knowing you're doing something to make the world a better place - & that is what this section is here to help you do. Below you will find links to help you learn more about what simple steps you can take to make a difference: things to read, documentaries to watch, guides to download and print, apps to add to snazzy phones & petitions to sign to get your voice heard. Animals don't have a voice, so it is hugely important that we use ours to speak out on their behalf. This documentary completely changed my life. 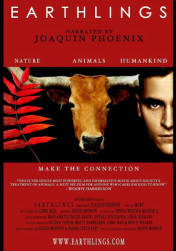 Narrated by Joaquin Phoenix and written/produced/directed by Shaun Monson, Earthlings took six years to complete due to the huge obstacles that had to be overcome in order to accumulate the footage. Now considered the definitive animal rights film by organizations around the world, it gives us profound insight into how our world uses animals for food, fashion, pets, entertainment and medical research. Click the poster to watch in full. The first feature length investigation into the hidden world of modern animal testing and vivisection. Containing footage and testimonials from former lab workers who had a change of heart about their work and charting the lives of the animals who have suffered in 'the name of science'. Karol Orzechowski's documentary has been said to approach an old debate with new insight and is set to be a very important work for the animal rights movement. Cick the poster to visit the official website. This Oscar nominated documentary is fantastically informative and truly inspired me to completely re-evaluate how I spend my money. Taking a sharp look at how our food is a produced and sold to us this film demonstrates how we can truly start making a difference in the world by being smart consumers. Click the poster and visit the Food, Inc. website to learn more. The wonderful people at Leaping Bunny are doing an amazing job in the fight for cruelty free cosmetics and have put together a variety of guides to help you buy products that haven't been tested on animals. Head over to their site for FREE pdfs of their Shopping Guide & Global Guide or fill out a form and have a handy pocket sized guide sent your house. They've also created a Cruelty Free App which is now available for both iPhone and Android systems.